Many of us don’t know that 90% of the information transmitted to the brain is visual and it is transmitted 60,000 faster than the text. In this age people don’t have time and they want to get information as fast as possible. Therefore delivering the information of your product and services in the image form is much more effective than other medium. Designing your content in the form of videos, images and info graphics is the most effective way to impress your clients. Social Media is the most used platform to deliver this type of content. Companies that do want to advertise can post images and videos through their account which enables to them to reach a large audience. Sites like facebook, Instagram, tumbler and pinterest are great medium to convey your message for visual content marketing. According to studies the use of social media sites will increase and images will have more impacts on the user. Pin interest is growing at a very fast pace. These facts show the use of effect of visual content and how it can increase your business. There are large no of visual content that you can use for your marketing strategy but using the correct is more important for your success. For promotion you can use pictures, videos, info graphics, comics and even memes at your end. Any of these medium have the potential to deliver the results but using them the right way plays a significant role. Use your visual content in a story form- People are more inclined towards reading stories and that is the reason people love to watch movies and novels. If we are able to make a good story than chances are that people will read it. You can insert your company history and the profile to impress your clients. A good picture will able to make an impression whereas a good story will be remembered for a long time. Give your clients a story which is impressive and effective for making a brand presence in the market. Establish your brand- With the help of visual content you can create a brand image of your business. Through social sites account you can introduce your product and services for a large base of audience. It’s your primary goal to introduce you and your business to the people. Find a balance- It is very important to link your visual content to your business objective. There are lots of ways in which you can express your business through visual content. If you are able to make a presence of your business through visual pictures and images then you are at the right place and you have made way for the growth of your business. Make a difference- Many companies are already making a big amount of revenue through visual content marketing. They are creating which tell about their business for creating a brand image in the market. They are applying images and other visual content for promoting their business. 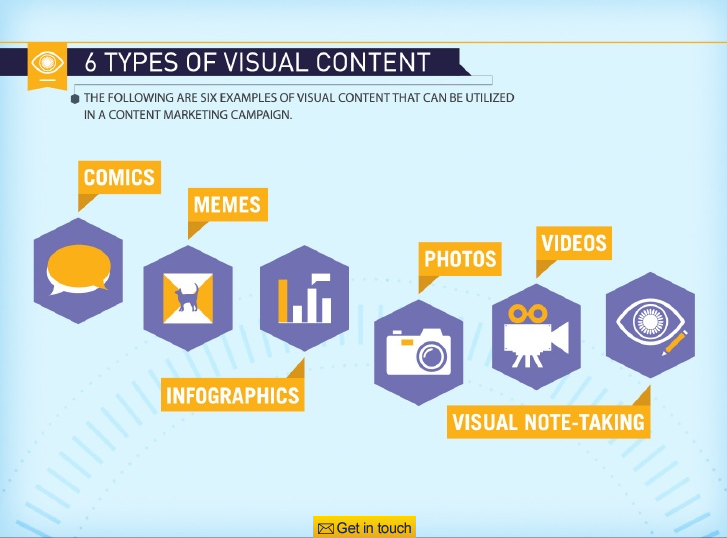 Therefore you can also benefit by making a good strategy for visual content marketing. You can start this by making effective images and videos to tell your company business. best free website on Why Responsive Web Design is Important?